When you get tired of being surrounded by the same furniture or the same set of curtains, you wish you could change things around a bit to refresh the look of your home. However, it sometimes costs an arm and a leg to buy new furniture or do paint jobs to refurbish your home. Well, worry no more. FeedFond has collected 14 unbelievably low-cost solutions to a brand-new look for your home. Scroll down to read more. Changing the color of your walls will add a new dimension to your room. 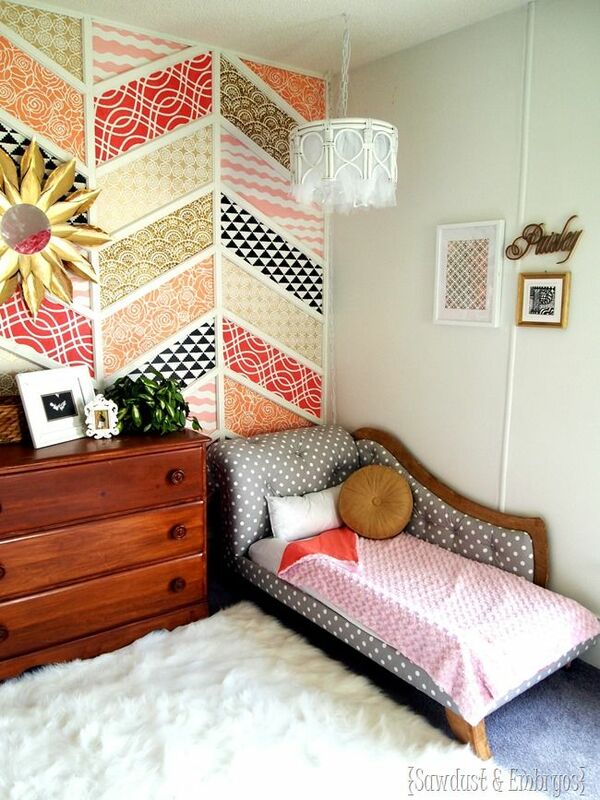 If you want patterns on your wall, buy stencils from a craft store and use a brush to trace the pattern on the wall. After the tracing is done, pull off the tape. Fill in with colors of your choice. Alternately, you can color any one side of the room in a contrast color from the rest of your room. Dark and deep shades on any one side of the room can give a new look. Try hanging different sized paintings from the wall with a different color. Use a good quality gold spray paint to paint your plain old boring chair into a glamorous work of art. 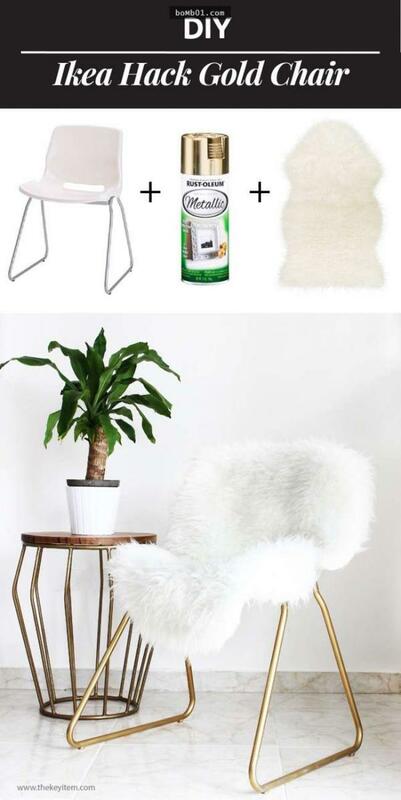 Use some faux fur material to cover the chair to give it a posh look. Split a large room into two smaller ones by using partitions or curtains with contemporary designs. If you want to brighten up your wall without going for a completely new paint job, trying mounting wall hangings on one side of the wall. Be sure to match appropriate accessories to make the look complete. You can make your own artwork by using Illustrator to do a sketch. Grab some acrylic paints, a canvas, and some painter’s tape to complete the job. 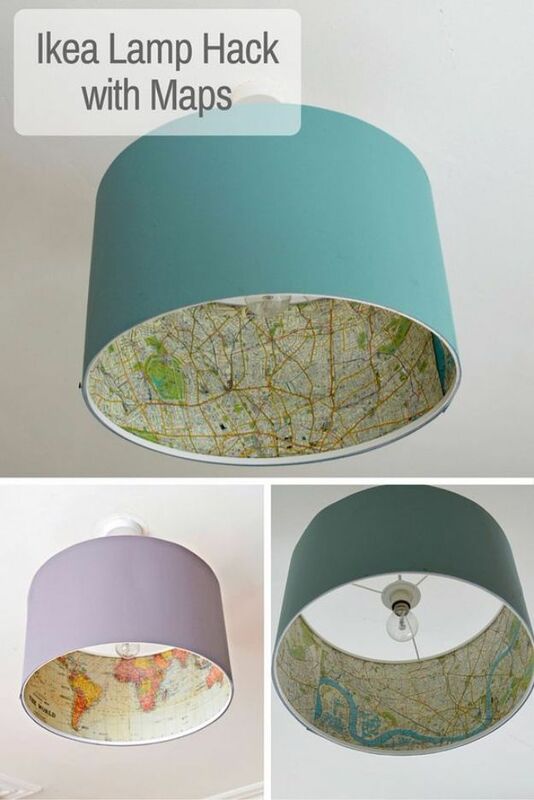 Give a new lease of life to your old lampshade by lining the inside, not the outside, with a map or any other picture that catches your eye. You’ll need leftover wood from porch railing, 2 small mason jars, 2 hose clamps, and drill and screws. Use a table saw to cut the wood to the desired length. Then buff the edges of the board to remove any splinters and rough edges. Use a drill to make a hole in the hose clamp and drill a small hole in the wood where you would screw in the hose clamp. Now line them up and drill the hose clamp into the wood. Lastly, tighten the hose clamp to fit the mason jar. Put a candle or flower inside the mason jar. Throw some pillows with different colors and patterns on the cushions at one corner of your room to turn it into a brighter one. Turn an ordinary looking fridge into a home decor. All you need is some tape and some gold spray paint. Apply the tape in horizontal strips where you don’t want the paint. Now spray on. 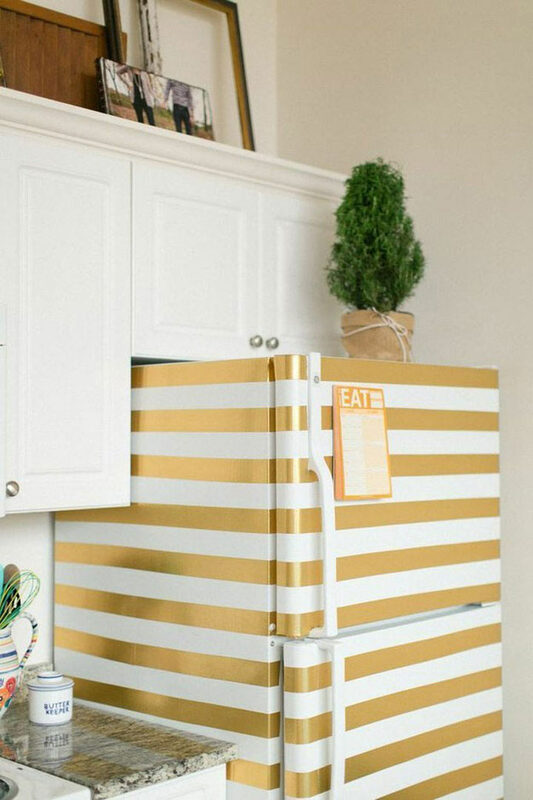 After you remove the tape, you’ll see a nice striped fridge exterior. 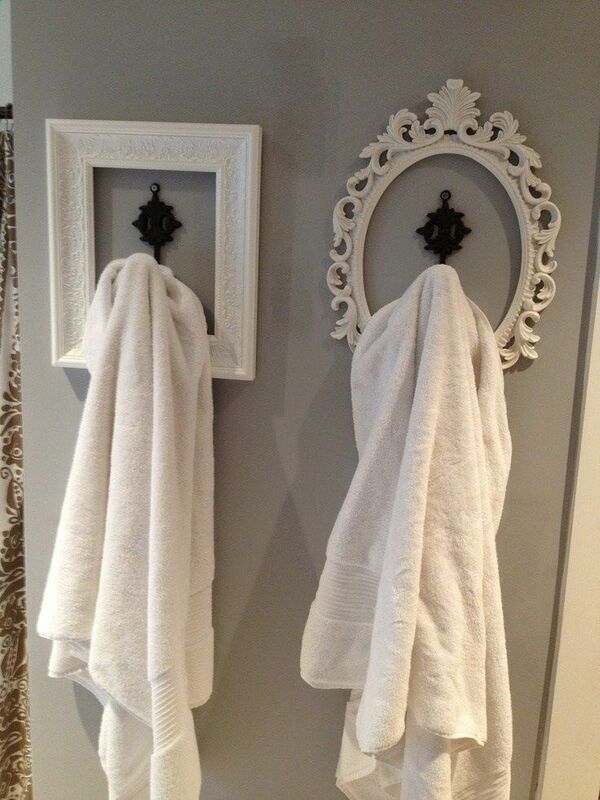 Try adding a bit of royalty to your bathroom by hanging frames around the clothes hooks. First, take out the drawers and support beams inside the dresser. Then cut, paint, and install a longboard (the length of the dresser) for the bottom of the dresser for additional support for the baskets. You need to sand every square inch, prime, and paint it. Finish by putting on a few coats of paint. Cut and sand a glass overlay to protect the top of the stand (using 1/4″ plate glass). Install drawer handles on the drawers and put wicker baskets in the hollow spaces. Ta-da! Start by making all cuts for top and bottom frames. Then drill all the pocket holes for 1 1/2″ thick boards. Attach the top frame with 2 1/2″ pocket hole screws and do the same for the bottom panel. Flip the top frame over and attach the bottom frame to it with 2 1/2″ pocket hole screws. Flip it back over and attach the center support with 2 1/2″ pocket hole screws. Attach the 2×3 cleats with 2 1/2″ wood screws. If you use 2×2’s for the cleats, get furring strips to save money. Spax self-tapping screws don’t need a pre-drill with them. If you use regular wood screws, make sure to pre-drill first to prevent the wood from splitting. Finish by applying one coat of Rust-Oleum Dark Walnut Stain. 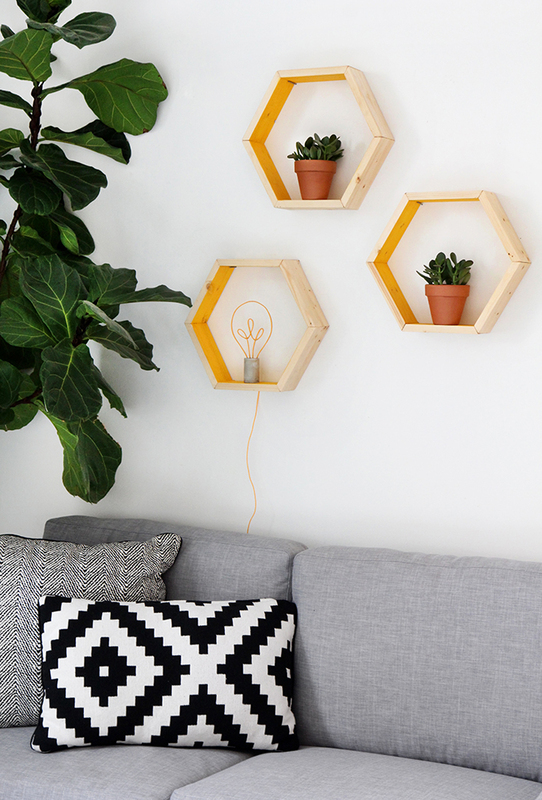 Trying adding some hexagon hanging shelves to give your walls a new look without burning a hole in your wallet. You’ll need 1in x 4in or 6in x 6ft wood, miter saw, sandpaper, wood glue, staple gun, Minwax Wood Finish-Natural, sponge brush, yellow acrylic paint. First, set your minder saw to 30 degrees, and cut six 8″ pieces of wood, making sure that the cuts on both sizes are angled inward. Next, create the hexagon, and glue all the joints together with the wood glue—let dry for an hour. Now flip over the hexagon, and on the backside staple each joint together with two staples. Let dry for 24 hours. After it’s dry, sand any uneven corners. Customize the shelf by painting the inside yellow or any other color of your choice. Finally, hammer nails in the wall that will be disguised in the corner of each hexagon, or use a bracket to hang each shelf. 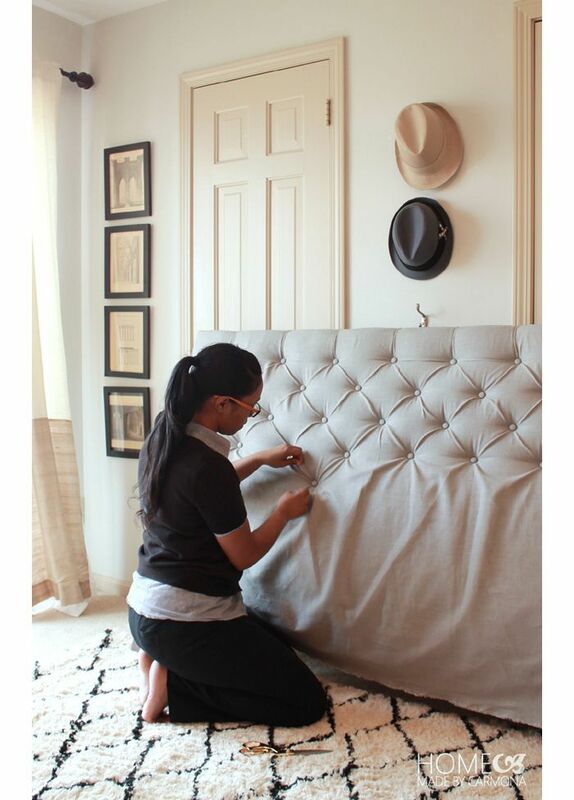 Give a new look to your bedroom by making a diamond tufted headboard. You’ll need an old headboard frame & salvaged boards, egg crate foam mattress topper (twin sized even for a King headboard), fabric of choice, button covering kit (5 buttons) or Button covering kit (18 buttons) (3/4″ buttons), regular buttons, upholstery twine / hemp cord / waxed button thread, gorilla glue. Strip down your existing headboard. Use scrap wood to cut to the length of the headboard frame. Use an old broken wardrobe to cut to length and nail it onto the frame. Now, mark drill holes for tufting. Use the pegboard for the backing of the headboard and footboard. Measure and mark the center of the headboard. Center the pegboard in the center of the headboard. Start from the marked center, but three holes down, and work your way across that row. Use a sharpie to dot the headboard beneath, it helps to circle the outside of the dotted peg hole so you don’t forget which has been done. Dot and circle a hole, then count 8 and dot and circle the eighth. Do this all along your row horizontally, and also vertically. The second row should be staggered and start down and across from the fourth hole to create a diamond shape. When you run out of pegboard simply move it over and line it up with the dots that you already created. Continue until the entire top half of the headboard is marked. You don’t have to do the entire headboard, just to about where the mattress will lay. Once you have finished dotting the surface of the headboard, take a moment to double check that you haven’t missed any spots. Now drill holes through all those dots! The holes don’t have to be very big, just wide enough for a needle to poke through. Brush off all that sawdust. Take two twin pieces of egg carton mattress foam.Place it on top of the headboard, egg carton side down. Line it up with the top and sides of the headboard and trim any excess not needed. Next staple the sides and bottom (not the top). Next drape on the fabric with an extra 10-12 inches of material on all sides. Keeping the fabric draped, raise the headboard upright and prop it up against a wall at an angle for later. Now cover the buttons. You will need a long upholstery needle with a fat eye, regular buttons, and upholstery twine. Start by threading a long piece of twine through your needle, then threading a button through to the ends. Push the needle through the drilled hole from the back to the front. Start at the top and center-most hole, and be sure to keep your needle straight. While you hold the needle from the back, carefully press down on the foam from the front until the needle pushes through the front. Pull it out slightly. Then you will be able to walk around to the front and pull the needle the rest of the way through. Now you can thread your covered button in the front. Thread the needle through the shank of the covered button (the hole). 2. Loop it around and through the shank again. 3. Pull the button down the thread and tight, as deeply into the foam as you can. The loop should cause it to hold in place for a bit, if not just pull it tight again. 4. Cut the thread end and pull the needle off. 5.Tie (like you would shoelaces) the two pieces of twine tightly into the underside of the button. 6. Pull the two twine strings to the opposite side of the button and tie off again. Do this several times alternating between the two button sides so it is secure. 7. Cut off the excess string and tuck it under the button. 8. Pinch the fabric to create a pleat. After you do your first button, stop and pinch tuck to create a little fold-over lip that goes up to the top. Now add the next button, then create a pleat again. Once you have completed the first 3 or 4 buttons, pull the top pleats tight and staple in place at the back. Make sure all your tuck pleats are facing the same direction. Continue with the other buttons in the top row, then be sure to staple those pleats in place as well. Once you have completely tufted your headboard, it is time to secure the fabric all around. Lay the headboard face down on the ground for this step. Fold and tuck the top sides down and pull it across to create a perfect top-to-side seam, then staple in place. Continue down both sides, pulling the fabric taut as you go. It just needs to be straight and look good from the front, not the back. Before you staple the bottom, lift the headboard upright again and trim any excess around the legs. Tuck under, pull tight, and staple from the back. Give a new look to your table by turning it into a glow-in-the-dark one. Simply mix photoluminescent (glow) powder with clear casting resin to fill in the naturally formed voids on your table. The glow powder charges up in sunlight and gives out a cool blue glow when in darkness. Share your favorite home refurbishing tip in the Comments section below and check out 90-Year-Old Czech Lady Artistically Transforms Her Hometown. Homemade Carpet Cleaning Hacks – Get Rid of Stains in No Time!